Buy the latest ZStar Manual juicer from Tribest at Harvest Essentials. Harness the power of the Ultem auger for extracting all you need at home or on the road! The Z Star Z-710 Tribest Manual Juicer makes it affordable to be able to juice wheatgrass at home, or on the go. 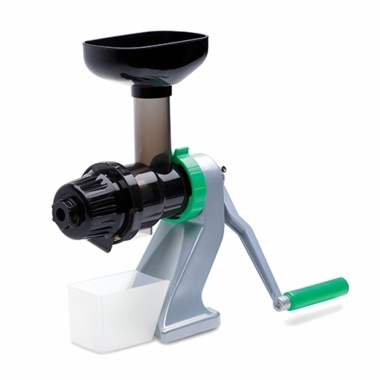 The Z-710 Tribest Manual Juicer features an Ultem juicing screen and auger and is virtually BPA-free. The unique single auger design uses an extremely gentle and efficient process to extract more high quality juice from each blade of wheatgrass, without electric power. Not only can it juice wheatgrass, the manual Z Star Juicer can also extract great tasting and nutritious juice from a variety of fresh fruits, vegetables, and leafy greens. The Z Star Juicer is lightweight, portable, and versatile, so you can enjoy fresh juice wherever you go!